DAC has received correspondence from the ministry of Youth, Sport and Culture in Jamaica, expressing interest in collaborating with South Africa in the area of film, and particularly initiating talks around the possibility of a co-production treaty with that country. I would like to request SASFED/DFA through the considerable network of members and associates to put this out there and find out if anyone would know of any activity of interest happening in Jamaica re Film, and if South Africa could derive benefits from such a partnership with Jamaica. We are a french studio of recording and we'll pleased to make a partnership with South Africans compagnies. Reactivity and adaptability are at the base of our job, so it's important for us to send our recordings as fast as possible. Furthermore, the time difference between our two countries is only of 1 hour. We are aware of the diveristy of minorities in your country, that's why we propose you our services. So if you need some french voices for your spécifics recordings or that you simply want to add more voices in your voice list, just think about us ! The Mexico International Film Festival is excited to announce our annual Call for Submissions for film and screenplay projects! The festival will be held May 28th - May 30th, 2010 on the serene and beautiful Baja Coast of Mexico. 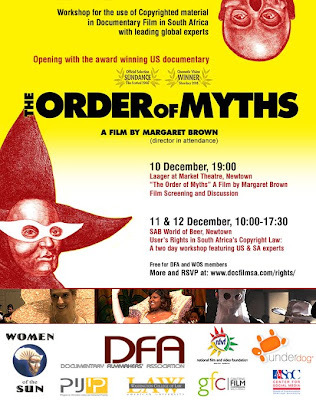 SA Première - "The Order Of Myths" and Workshop on the use of Copyrighted material in Documentary Film in South Africa with leading global experts. Apologies for those not in Gauteng next week, this event is unfortunately only Gauteng based. The Documentary Filmmakers Association (DFA), Women of the Sun (WoS), and American University’s Program on Information Justice and Intellectual Property and Center for Social Media, American University, invite you to a special 2-day workshop and film screening focusing around the issue of expanding the utility of copyright “users’ rights” for documentary filmmaking. Please see attached flyer for this film, and feel free to pass on this e-mail to others you feel may benefit. Sponsored by the Ford Foundation and the Gauteng Film Commission, the City of Johannesburg, Underdog and most recently the NFVF, this workshop will feature the launch of Untold Stories in South Africa: The Creative Consequences of the Rights Clearance Culture for Documentary Film, the final report of a year-long study of rights clearance and documentary film in South Africa. The workshop will begin with a public screening and discussion with the director of The Order of Myths, a documentary that explores race, music and celebration at Alabama’s Mardi Gras, and which benefitted from a project in the U.S. working with filmmakers to understand users’ rights under copyright law. Click here to learn more about the film. The following two days at, workshops will be conducted on how South African filmmakers can use and expand users’ rights under South Africa’s copyright law. All of the events are open to the public and FREE of charge for members of DFA, WoS and BFN. There is a minimal charge for others to attend the Workshops to cover catering. The Opening and film screening is FREE to all. Workshop Day 1: User’s Rights Under South Africa’s Copyright Law: What are They and How Can Filmmakers Use Them? Workshop Day 2: Expanding the Utility of Users’ Rights: Implementing the Recommendations of the Cape Town Workshop on Copyright Clearance and Free Expression, March 2009. FREE to DFA, WOS or BFN members and invited guests, a subsidised fee of R80 for others can be paid at entrance, includes lunch, and refreshments. Peter Jaszi, Professor of Law, American University Washington College of Law, Author of Copyright Law (2006) and Director of the Fair Use and Public Media Project. Please RSVP ASAP by using the online registration form at: http://www.docfilmsa.com/rights/register.php and don't miss out! On Thursday the 26th of November 2009, SASFED Co-Chair - Kgomotso Matsunyane gave a presentation for SASFED at the NFVF Indaba, which was witnessed by the department of Arts and Culture, the NFVF and extensive members of the industry. The Power-Point given is attached here... and worth the read. A PDF version of the document can be found here.